Full speech delivered by Hizbullah Secretary General, His Eminence Sayyed Nasrallah, on the Divine Victory Anniversary Ceremony held in Bint Jbeil on August 13, 2016. I seek refuge in Allah from the accursed devil. In the Name of Allah, The Most Compassionate, The Most Merciful. Peace be upon the seal of prophets, our master and prophet, Abi al-Qassem Mohammad, and upon his chaste and pure household, and upon his chosen companions, and upon all messengers and prophets. Brothers and sisters! Dear attendees! Peace be upon you and Allah's mercy and blessings. Praise be to Allah who defended us, sustained us, and supported us with His victory. He bestowed on us His goodness and supplied us with security, peace, serenity, pride, dignity, sovereignty, and honor. Praise be to Allah for His countless and numerous blessings. Brothers and sisters! I welcome you all in this blessed and solemn ceremony marking the tenth anniversary of your victory - the victory of the blood of your martyrs, nation, Resistance, army, and people in the July War 2006. In fact I have a long list of thanks. Now I will talk in general, but at the end I have a comment. We extend our thanks and regards to all those who made this victory and contributed to making this victory, establishing it, protecting it, supporting it, and backing it, whether the men of the Resistance, the national army, the security forces, the martyrs, the wounded, the detainees, those who remained steadfast in their land and those who were displaced from it, those who received and embraced the displaced, the sacrificing, the patient, the wounded, as well as the religious, political, military, security, and media leaderships, the parties, the forces, the currents, the associations, the societies, and mass media, and all the good people in Lebanon and across the Arab and Islamic world, and everywhere around the world. Special thanks to all those countries that backed the Resistance and supported it with all their power. Special thanks to Syria and the Islamic Republic of Iran for the historic stance alongside Lebanon and the Resistance in the July War 2006. However, it seems that the "Israelis" marked the tenth anniversary of the war with greater concern than the Lebanese and the Arabs. Anyway, it is my duty to thank and laud some media outlets and some sides which highlighted the anniversary and showed special interest in marking this great ceremony. Still the concern of the "Israelis" was greater. In fact, all officials in the "Israeli" entity, including the head of state, the prime minister, the war minister, the current and former ministers, the military and security leaderships, and media outlets were much more occupied during the last 30 or 33 days with the event. They talked, expressed, and interpreted the July War of 2006. I will use the term the July War though they call it the Second Lebanon War, as they changed its name after their defeat. Now to lower its impact, we say the July War. In fact, to the "Israeli" entity and in the "Israeli" conscience, the July War became a very important, historic turning point with crucial repercussions on this entity. Thus, this war was not absent in the "Israeli" media, the "Israeli" arguments, "Israeli" discussions, the "Israeli" conscious, and the "Israeli" subconscious for ten years. Indeed, in the Arab and Islamic world and in Lebanon, industrious efforts were exerted by many to cancel out this war and the victories made in this war and the achievements of this war from the minds. I will talk a bit about the occasion and the war, and about this great victory. Then, I will tackle the situation in the region, and I have a word on the local situation before wrapping up the speech with a conclusion. Usually, when talking about the victory in the July War, the victory of the Resistance and Lebanon and the axis of Resistance, people tackle a broad and very important title called frustrating the goals of the aggression. How does he who wishes to say that Lebanon gained victory in the July War express this victory? He would say the proof is that the Resistance and those who backed it and this entire front frustrated the goals of the aggression. This is true, and this is a very important side of the victory of the July War. Still, it is one side of the truth. There is another side which I wish to talk about today. As per the first side, we recall that no doubt frustrating the goals of the US-"Israeli" aggression on Lebanon is a very great and major, historic, and strategic achievement. In fact, the aggression on Lebanon was a US decision as is the war on Yemen today. The decision of the aggression on Lebanon was a US decision executed by "Israel". Though frustrating the goals is a major achievement, still we have to tackle the other side of this issue. I will make a quick list of the goals which were frustrated, the goals the aggression failed to achieve, what was announced in the first days, what was disclosed later following Winograd Commission, what was said in recent years in the memoirs of US officials, and what was said weeks ago and written in US articles by some neoconservatives who were then in the US Department of Defense. Thus, I will mention the goals without giving evidences because they are all based on US-"Israeli" texts. So I will mention the goals, and you know that they were frustrated and were not achieved. Crushing the Resistance was the highest goal of the aggression. Then the goal was downgraded. It became recording the highest amount of destruction, killing the largest number of members and leaders in the Resistance, demolishing the capacities and capabilities of the Resistance, and disarming the Resistance. Then deleting Hizbullah from the internal and regional equation appeared later as a goal which the Americans talked about. Then they retreated to expelling the Resistance from the area to the south of the Litani River. Some sides in the Lebanese interior wished to charge the Lebanese Army with this mission. Among the goals which were frustrated too was turning the area south of the Litani to an uninhabited area that is off limits. That means a continuation of the policy of displacing the residents of Bint Jbeil and the residents of the area to the south of Litani indefinitely. Another goal was expelling the Resistance from the border. Now, everyone knows that the Resistance is still on the border because you are the Resistance, and you are the residents of the villages and the towns on the barbed wire. A further goal was deploying multi-national forces - [not UNIFIL, but forces like these which occupied Iraq and likewise failed in their mission] on the Lebanese-Palestinian border, and on the Lebanese-Syrian border, to prevent the Resistance from being active again, in the airport, and at the seaport, to control Lebanese sovereignty and to annex Lebanon once and for all to the regional security and political assemblage of the US and its allies. Other goals were rebuilding "Israeli" deterrence power which was corroded, especially after the defeat in the year 2000 and the withdrawal from the Gaza Strip, boosting the state of "Israel" on the regional and international level, and releasing unconditionally the two "Israeli" captives. These goals were mentioned. However, there remained the most important and comprehensive and broadest goal, which all these other goals worked towards. It is what was announced by Condoleezza Rice: the birth of a New Middle East. You still remember that the US used to occupy Afghanistan and Iraq. US fleets were in the seas and oceans. The US was threatening Syria, and it set the project of a New Middle East. After all that the US achieved in the region, one of the steps leading to a new middle east was crushing the Resistance in Lebanon; a step to be followed by controlling Syria, hitting the Resistance in Palestine, isolating Iran as a prelude to toppling it, and achieving the goal of a New Middle East, which means the absolute US-"Israeli" hegemony on everything in our region for hundreds of years to come. These great, major, strategic, historic goals were frustrated. Indeed, it was a great and very important victory, and this issue is enough to prove evidence of the greatness of this victory. Still we want to open another gate and highlight another title for this victory as briefly as possible. The other side of the truth about the victory in the July War are its end results. Some results were not anticipated and intentional goals for the Resistance. The Resistance in the July War was in a state of total defense. If you asked about the goal of the Resistance in this war, the answer would be frustrating the goals of the aggression. However, apart from your goals and intentions, all events and field facts have consequential results. These results did not come from nowhere; they are rather made through the Resistance, through steadfastness, through sacrifices, perseverance, the blood of martyrs, and the wounded, besides the unity, integrity, and cooperation in conducting the war which was ongoing. Thus, I call on the researchers and scholars to work on this side of the issue. Indeed many scholars worked on this issue; but the first aspect of this issue remained the most prominent.So let's carry a review or a study of the military, security, political, cultural, moral, and economic results of this war to get acquainted with the other side of the victory which was achieved in the July War. Indeed, this is what I call upon from experts and researchers, and we hope that they would exert great efforts in this regard. However, I will mention very briefly some quick points, especially those pertaining to the entity of the enemy and the Resistance. As per Lebanon in general, the region, and the political, military, and security results, that would be a very wide field of study. So, I will just list some tangible undisputable results. This is similar to the case of saying that so and so died. It is undisputable; he died indeed. Likewise, when you say so and so person resigned, it would be that he really resigned. These points are undisputable. The Question that follows the July War: Will "Israel" continue to be? First, the "Israeli" military institution was shaken from the inside. Following this war and its repercussions, the "Israeli" Army was shaken vehemently and fiercely. It was in a state of disintegration and moral weakness. It was in a state similar to a breakdown. Accusations were exchanged between the chief of staff, the general staffs, heads of units, regional leaders, officers, and soldiers. The accusations reached the extent of abusive insults and accusations of treachery. All of this is can be found and you have been reading them for ten years by now. This case is unprecedented in the history of the "Israeli" Army. This fierce shake up consequently led to a string of resignations, discharges, and dramatic changes in this army. This is what led to a crisis of trust which is still ongoing up until our very day within the military institution, between the higher ranks and the lower ranks, and consequently, between the lower ranks and the soldiers. Neither those who are superior trust those who are inferior, nor those who are inferior trust those who are superior, and this will be reflected in any war in the future, as it was manifested in the Gaza War which took place later. Second, the trust of the "Israeli" masses in the army was shaken; I will not exaggerate and say the loss of trust. They do not believe anymore that this army is able to produce victory, and that this army is able to put a decisive end to any battle. In fact, this is the most dangerous crisis currently faced in the "Israeli" entity. The current "Israeli" Chief of Staff Eisenkot says that the greatest threat to the army is the loss of public trust. This is true. Third, the trust of the political leadership in the army and its generals was shaken. As if they are telling them your expectations are wrong; you are exaggerating; your plots are not precise; you are powerless. This has been the case for ten years now. Fourth, the trust of the army in the political leadership was shaken as the latter was hesitant, weak, afraid, and perplexed in taking decisions during the July War. These five topics are just stations, but there is still the essence of the crisis which I will refer to in a while. Due to the July War something was harmed. This thing is called the trust of the "Israeli" public in their leaderships and army, the trust of the leadership in the army, and the trust of the army in the leadership. Whenever any entity loses this trust, it means it is heading towards a very dangerous fate. Here I am not talking about temporary, transient, technical or strategic results. I am rather talking about moving towards a definite fate. Sixth, the "Israeli" military doctrine fell in the July War. This doctrine was set by Ben-Gurion ever since the entity was established. All the previous Arab-"Israeli" wars did not down this "Israeli" military doctrine. At most, these wars led them to just make some superficial amendments. However, on the day that followed the end of the July War, a committee called the Security Committee for Developing the Security and Military Doctrine was formed. It was headed by a Likud leader in the Knesset. They held long sessions to review and reconsider the "Israeli" military doctrine. In the past, the "Israeli" military doctrine depended on quick military settlements in the field, achieving quick victories, and fighting on the land of the enemy. The army fights on the land of the enemy and on the borders while the internal front is peaceful, enjoying a swim on the sea coasts. This was the "Israeli" military doctrine. Indeed, there are many details in this doctrine but I do not want to tackle them now; however, it is enough to tell you that all of that is over today. Today, the "Israelis" put or formulated a new doctrine that does not include decisive military victories, because they know that they are not able to achieve that. It does not include fighting on the land of the enemy; rather there is fighting also in the territories they are occupying [It is not their land after all]. Moreover, there would not be fighting that is disconnected from the internal front. This was confirmed by the July War and the Gaza wars. They can't come and fight in Lebanon and bombard Lebanon while [their settlers] have a picnics in the northern settlements or in Haifa or in the regions far beyond Haifa. This is over. This era has come to an end. They are seeking to form a new doctrine, and they confess and accept -you know that for over sixty years of the Arab-"Israeli" struggle, many people delivered speeches threatening and intimidating "Israel", but usually the "Israelis" used to comment sarcastically on them. However, the "Israelis" believe in all that the Resistance in Lebanon says, not only because they know that it is honest, but because the data they have asserts that for them too. Their information asserts to them that there is no target or point in Occupied Palestine that can't be a target for the missiles of the Islamic Resistance in Lebanon, and they know that. Thus they are in need of a new military doctrine that takes into consideration the internal front. For decades, the enemy has been working on the internal front, and so far, it is not ready. They did not resolve the problem yet. Seventh, the enemy's political and military leaderships are aware that the "Israeli" power is limited. After all, they can't do all that they want to do. The era of sending a musical band to this place or a commando [mission] to that place, or execute an airdrop here or issue a threat there, is over. Eighth, the "Israelis" lowered the ceiling of their aspirations, whether the overt or covert ones. That means that when the enemy wants to put any covert goals to any war, these goals would be humble, and when they announce their goals, they will announce humble goals. You notice that following the July War, when they went to the Gaza War, they did not dare to announce major goals. They did not announce any goals. They did not dare to announce even humble goals. These are among the results of the July War. Ninth, another result is the confinement of the direct "Israeli" functional role for executing US schemes. In fact, in the July War, "Israel" was a tool for implementing a US scheme. This executive tool failed. That means that the Americans have "Israel" as an executive tool in the region, and for years and decades, they have been funding it, arming it, and supporting it. Thus we say that it is an advanced military entity for the US in the region. It is a base. When they came to use it to achieve the scheme of a New Middle East, it failed and disappointed the hopes of its US masters. This is what you read in the memoirs of George Bush, Condoleezza Rice, and the neoconservatives, and in the articles which were published lately. Tenth, and this is a very important and great result. It is that the ghost and question of the existence and persistence of the state of "Israel" returned to the forefront inside "Israel". Now if a figure in the Resistance or from the supporters of the Resistance talked about this point, they will be told that they are exaggerating. Directly after the July War, talk returned among the generals of "Israel", the leaders of "Israel", and senior theorists in "Israel" about the existence and continuation of "Israel". Is there a possibility that this "Israel" continues to be, or is it falling and moving towards extinction? When did that take place? That took place after the July War. Before the July War, "Israel" was in a totally different state as per confidence, power, capability, persistence, deterrence, continuity, hegemony, and control, especially since the Americans were in Iraq and Afghanistan, and in the oceans and seas, and in the region, and the so-called strategic environment. Everything was turning towards the interests of the US and "Israel". On the eve of the July War, there was no question anywhere or in any "Israeli" mind on the continuation of the state of "Israel" or the "Israeli" entity. This question was evoked anew after the July War. Let's give our evidence. I will talk about the current "Israeli" head of state. His name is Rivlin - indeed in Lebanon no one hears about him. What did he say? 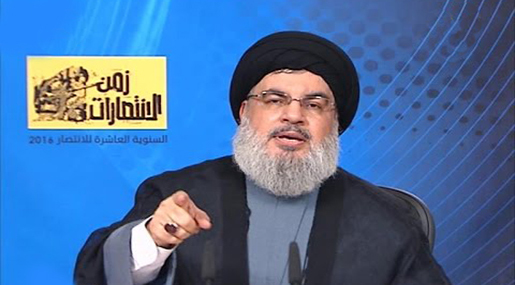 He said that Hizbullah does not stop its efforts to destroy "Israel". He recently called for uniting the "Israeli" front in the face of any potential future confrontation [Allah only knows the timing]. Let all the Lebanese and Arabs and people in the region listen to this. He acknowledged clearly that the "Israelis" know that in any future war - if it was imposed on them - it will be harsh. Bear in mind that the "Israelis" are saying that if a war is imposed on them, that is, there once was a time when "Israel" used to impose wars on the states, peoples, and governments of the region. He carries on saying that they would emerge from any such war with the upper hand. Indeed, he wants to boost morale. He then says: Because, my friends, we will not have another date. Now, what is the president saying? He is saying that if "Israel" heads to a new war and is defeated, there will not be any new war because there will not be "Israel" anymore. This is a question of existence and continuation. For his part, Netanyahu talks about what took place in 1967, 1973, 1982... He talks about persistence, hegemony, control...Then he says that after the Second Lebanon War in 2006, the direction was turned downward as per "Israel". This is clear now. For those in Lebanon who are still seeing unclearly, I say that it is clear now that "Israel" is no longer an unconquerable state. This is over. The question over its continuation is being evoked again not only among the foes of "Israel" but also among its friends too. Today there are studies being carried out by senior strategic officials in the US that talk about the future of "Israel" as not being a long one anymore. They are not talking about dreams or foretelling, or quoting Nostradamus...They are talking so based on true and factual information. He is saying, not only the enemies, the friends of "Israel" started asking this question over the persistence of "Israel". What does Shimon Perez say before the Winograd Commission? These are very important statements. They are "Israeli" senior figures who are talking and not just any figure, professor, brigadier, or general in the Resistance. Shimon Perez says that before this war, the Arab world had taken for granted - one way or another - the existence of "Israel". He says that was the case except for Iran. He carries on saying that after the war, this retreat began. The validity of the saying that there is no military solution - meaning that the July War led them to this conclusion, there is no military solution, go search for a political one - the validity of the saying that there is no military solution means that "Israel" cannot remain in this region. Is there something that is not clear here? It's clear. Eleventh, another result is promoting the strategic deterrence of the Resistance in Lebanon to protect Lebanon. That's because we always used to say after 2000 that we want to create mutual deterrence. There is nothing new as per the "Israeli" deterrence because since 1948, "Israel" is the deterring power which is practicing deterrence. The problem is that the "Israelis" have always been the deterring power while many of the Arabs were deterred. What's new after the July War is that there has come about a state of mutual deterrence recognized by the "Israelis". We used to say the phrase ‘if a war was imposed on us'. But who is saying that now? The "Israelis" are saying should a war be imposed on them. So this deterrence is not mere words. It is a true fact - a status quo - tackled by all "Israeli" political, military, and media officials. They acknowledge that Hizbullah in Lebanon has the ability of deterrence. This is for granted in "Israel", and accordingly the "Israelis" take the political and military decision, and set plots and strategies. I will go back to Netanyahu's speech days ago when he talked about the formula of calmness for calmness. With whom is this calmness sustained? It is with a side which he knows is growing more powerful and more armed. He is talking about calmness for calmness with Lebanon, with whom they did not conclude a peace accord, and with whom did not make commitments, gain benefits, or [agree on] security measures. Where did this formula come from? It is a result of a clear and decisive "Israeli" recognition of the mutual deterrence formula which was consecrated by the results of the July War. This is the result before your eyes and the eyes of the people who have eyes, and whose grudges do not prevent them from seeing. I did not bring along any evidence from words said by anyone in the Resistance or the axis of the Resistance. I intentionally gave "Israeli" evidences. [And one of their own bore witness] That's because some people do not believe us but rather believe the "Israelis". They say that and talk about that. The conclusion I want to draw from this topic before moving to the regional situation is the following: the common factor I want to reach from all of these results or the water mouth that all of these streams pour into is the following: in the July War, "Israel" was struck in its soul. Now if someone is struck on his body, his hand would be severed, his ear would be cut, his leg would be amputated. However, being struck in the soul is difficult, and recovering from it is difficult. Being struck in the soul is almost always fatal. "Israel" is struck in its soul, in its confidence, in its determination, in its will, in its hope, in its aspirations, in its self-esteem, in its pride, in its haughtiness, in its arrogance, in its serenity, and in its persistence in the region. It was struck in its self-confidence and in its trust in its army and in its trust in its capabilities to defeat others, and now it doubts its ability to persist in the region. This is the greatest and biggest achievement. Put frustrating the other goals aside. This is a great scene. This is a great scene in the Arab-"Israeli" struggle, in the history of the Resistance and the struggle between the Arabs and "Israel", and between Muslims and Christians who support the choice of the Resistance, and "Israel". This greatest achievement in decades has been made in July War. Where does the problem lie? They always used to say: what is most important is to work on numbing Arab awareness and Palestinian awareness. There are numerous texts to this effect, but I will not take much of your time to read them for you. There are numerous texts to the effect that since Ben-Gurion and even before him and after him, the Arabs must be convinced that "Israel" is undefeatable. They must be convinced that the Arabs can't take anything from "Israel" by force. The Arabs must be convinced that they must accept the morsels "Israel" grants them. This must be stimulated in the Arab conscious and subconscious. On the other hand, haughtiness, confidence, power, and the ability to make victories must be stimulated in the "Israeli" conscious and subconscious. There is a popular proverb in "Israel" that says: "Let the army win" which is used when politicians complicate things. This is because it is for taken for granted that the "Israeli" Army gains victory wherever it goes. This had been worked on for decades, but the July War preceded by the victory of 2000 had set the foundations for numbing the "Israeli" awareness. Now as we have seen in the short film a while ago, and which I will talk about later on, why did the enemy in 2006 insist on entering the city of Bint Jbeil? The battle was that of awareness; it was not that of stones, fields, roads, and neighborhoods. It was a battle that was meant to rebuild the "Israeli" awareness and numb the Arab awareness anew. Why Bint Jbeil? What about the Spider web? This is the truth about the battle of Bint Jbeil which I will go back to later on. In 2000, thanks to your sacrifices, steadfastness, and blood, I came to Bint Jbeil, and I had the honor to give a speech on the land of this field. I took an oath and said a well-known phrase: "Israel" is weaker than a spider's web. Right? We, in Hizbullah and all our allies, research centers, and media outlets did not do programs on the psychological, media, political, or cultural war of the spider web phrase. It was a word which was said, and we moved along. However, it stuck in "Israel", in the conscience of all the "Israelis" and their leaders, generals, media figures, and politicians. We are talking about what took place 16 years ago. Then the July War came to assert this logic, configuration, and truth which they are not able to flee from. Someone may say that I may be highlighting this fact, and they may not talk about the spider web anymore. It is not important whether they talk about it or not. What is important is that I am certain they are convinced of that. Do you want evidence? On the tenth anniversary of the July War, days ago, the Prime Minister of the enemy, Netanyahu, who is the major figure in "Israel" and who is the leader now in "Israel", and whom they are confused in finding an alternative to, gave two speeches on the same day: one speech before the Knesset and the other on Herzl Mount, and in both places he talked about the spider web. It is not a journalist or a columnist or a member in the Knesset who is talking. Today Netanyahu is the head of the entity and the leader of the armed forces in the enemy entity. He talked twice on the very topic. Indeed, this term came in the course of his speech, but the very fact of uttering this term manifests how deep this term has been carved in his conscious and in the conscious of the entire society. Days ago he said: Anyone who thinks they will find a spider web here will come up against an iron wall and will feel an iron fist. O' yes! We have felt your iron fist in Bint Jbeil in 2006. Did we feel it or not? In his other speech he said: Hizbullah views us as a weak state that lacks a strong backbone and as a society that is weaker than a spider web which is sick of fighting and defending itself. I tell Netanyahu: Yes, you are a society that is weaker than a spider web which is sick of fighting and defending itself. This is the truth. Here I reach the battle of Bint Jbeil. Why did the battle of Bint Jbeil take place? It was a battle of awareness. We thought that they came to Bint Jbeil as they tried and entered Maroun al-Ras, Ainata, and the other villages and bordering areas - not to mention names here. However, later it was made clear and the "Israelis" themselves said that the sole goal of the Bint Jbeil battle was to reach the field so that an "Israeli" general would raise the "Israeli" flag and give a speech to the effect that "Israel" is not a spider web but an iron fist and a steel fist. Thus the battle of Bint Jbeil toppled the iron fist theory and confirmed the spider web saying by the virtue of the blood of the heroic martyrs. We all know what took place in Bint Jbeil in the July War: demolition, air shelling, artillery fire, rocket bombing by brigades, battalions, elites, and big numbers of tanks and vehicles. On the other side, it was a group of heroic resistance fighters who made this legend, and the army of the spider web fell short from reaching the field so that an officer would say: We are not a spider web. This is the story of Bint Jbeil. This is the gravest arrow that hit the "Israeli" entity. That's what I mean when I say "Israel" was struck in its soul, in its spirit, in its confidence, in its military doctrine, in its leadership, in its internal front, and in its ability to confront. Today, no one can take credit and tell Lebanon that there is no aggression staged against it. Neither can the Americans do so, nor the Security Council, nor the Europeans. Indeed, the Arabs can't prevent "Israel" from attacking Lebanon. In fact, there are people who call on them to attack Lebanon. No one can take credit and tell Lebanon that "Israel" is not attacking Lebanon by their virtue. For ten years, we have been living in security and serenity. I will return for these ten years of security and serenity later on. No one can ever tell us that "Israel" is not attacking us due to its good manners. "Israel" never had good manners. Why then aren't we witnessing these good manners in Palestine? No, this is the result of the July War. It is the result of the deterrence formula and the result of the change in the trust, faith, doctrine, intellect, awareness, morale, and spirit in "Israel". That was the result of the facts that were imposed by the victory of Lebanon, the Resistance, and the axis of the Resistance in the July War, and not anything else. Thus today and for ten years, we have been living in serenity and security. There is no accord with "Israel". No one gave "Israel" promises. No one granted it guarantees. There are no security measures with "Israel". On the contrary, "Israel" is deterred by a country whom it knows its resistance is growing more in number, arms, power, popularity, trust, faith, determination, will... So this was the formula it imposed. Well, the evidence is that today you are in Bint Jbeil, a stride away from the border. On this border, "Israel" was always in the position of taking the initiative to attack. We didn't dare to build houses on the border at a time when it used to construct settlements. Today, our people in the South build their houses on the borderline and on the barbed wire. The "Israelis" used to plough their land while our land was abandoned. I remember that when I came to Bint Jbeil in 2000, and when we finished the ceremony, we made a short tour on the borderline. The entire region was green on the other side while on our side it was almost dry. Now, the areas to our side are green. However, what have they done? They swept part on the greenery to make hills and valleys. Why? That's because they are afraid of the Galilee being invaded. This is the state of "Israel" nowadays. Our villages use to sleep with fear because we didn't know when the "Israelis" would stage a commando [assault], invade, kidnap, kill, and shell, while their settlements used to live in security. Now if anyone from any village takes a compressor to the border or near the border and starts drilling, the nearby settlements would flee. I do not want to exaggerate and say that if someone hits with a hammer on the border, "Israeli" military convoys will be summoned to the barbed wire. Our people - our children, men, and women - are not concerned about them. See the case after nightfall. Does anyone move in their settlements? No they sleep early now. See the case on our side. People remain awake until sunrise. What is this? Isn't this an achievement? This is one of the results. The "Israelis" used to erect barbed wires in the past. Why did they start constructing walls now? They started building walls because their military doctrine failed and was changed. Is this the story of "Israel" being able attack Bint Jbeil only? No! There are people in Bint Jbeil who are able to attack the Galilee. As we are supposed to put defense plans, they must put defense plans likewise. As we are supposed to be worried about the cities and villages, they must be worried over their settlements. These are the results of the July War. I will stop here. I only have to say a couple of words on the region and the local situation. However, brothers and sisters, today we wanted to highlight this conclusion. Indeed, this is just a conclusion. These are only some of the topics. We did not talk yet about the repercussion of the results on the level of the Resistance and its confidence, power, will, and its being embraced by the people, the view of the nation on the choice of the Resistance, and the alternative that the Resistance offered - the strategic, military alternative and the result and repercussions on the level of the region, the Resistance in Palestine, the stance in Syria, the victory of the Resistance in Iraq, and then the Arab Spring. Leave all of this for a future meeting. We do not have enough time for all of this. However, so far, I wished to say that this is the case of our enemy now. Isn't this a great, divine, historic, strategic victory even as per the results too? This did not come for free. This was achieved through grave sacrifices over 33 days and before and after that period of time. Well, allow me now to say a couple of words on the situation in the region. I call on all the Lebanese and all the peoples of the region to follow US statements. I call on the peoples of the region, the political leaderships, the parties, and all those who are concerned with public affairs to follow the statements being made nowadays in the US. Now some may say the Sayyed took us to the US. No, we are still in the region, and I call on them to follow the US statements on the US responsibility of founding and supporting Daesh. Let's start with a couple of words. Now there are sites on the internet that publish the confessions of US generals and security officials who were in the current administration - some are still in the current administration. They confess that they - the Americans - founded Daesh. Now some may ask: How is that so? I will comment on this. Why did they found Daesh, and first, how did they found Daesh? They used to penetrate al-Qaeda in Iraq - that is if they did not have total control over it. The penetration was very broad. They had a group of prisoners including Abu Bakr Baghdadi who was in a US prison in Iraq, and he was set free. In no time he became the prince of al-Qaeda in Iraq which was later called the Islamic State in Iraq. Abu Mohammad Golani, the leader of Nusra, was with Abu Bakr Baghdadi i.e. the Islamic State in Iraq. When they were dispatched to Syria, they were still with each other. Thus the Nusra [Front] and Daesh are one - as I always say - but they disagreed over the leadership. So the custodian of the project is one. The US called along some states including Saudi Arabia, [to use their] media, religious figures, and satellites to support this project and provide it with money, arms, and ammunition. They also resorted to other regional states to offer facilitations. They cooperated with the West too and gathered tens of thousands of fighters. A German research center said the number is 360 thousands who were brought along to Syria and Iraq. Perhaps they were not brought along in one batch and remained there at one time; they rather entered and exited. So, tens of thousands were brought along. Let's speak in very simple terms: can anyone imagine that the [same] America which pursues every single dollar, and who [closely monitors] banks in Lebanon regarding whom [they] open up accounts for, and to whom they deny these accounts, whether these banks open accounts for a hospital, or a charity organisation, or whether the account is for a cousin of so and so who is a cadre in Hezbollah, and the [same] America which pursues every single bullet, missile, and piece of anti-armour [missile systems], based on the confessions of the Americans, thousands of tonnes passed into Iraq and Syria, [does anyone believe that this was done] this without the knowledge and administration of the Americans? Definitely not. Funding, administration, arming - ofcourse, there was no need for America to get involved with instigation [of people], there are those who have high-level experience in instigation - and abundant amounts of funds, [using these resources] they produced this huge takfiri group, which was called the Al-Qaeda organisation, and which was then called the Islamic State of Iraq, then it was called the Islamic State of Iraq and Syria [i.e. Daesh], from whom the Nusra Front split thereafter. Following that, many groups and factions [were formed] that carry the same ideology. Okay why did you do this O' Americans? In all honesty, in all honesty, and this is available [for all to refer to], just as I referred to Israeli quotes a while ago [to prove my point], I will use American quotes now. Let the people hear, and see clearly, let them analyse, understand, and make decisions correctly. [The Americans did this] to strike the Resistance axis, and in particular, Hezbollah. In particular Hezbollah. This is not because Hezbollah is more important than Syria, nor because Hezbollah is more important than Iran. Rather, because Hezbollah was somehow considered the spearhead that is present in the battlefield, because it is a resistance movement that has room to maneuver, [room] that might not exist for states in the Resistance front. Therefore, the spearhead of this resistance axis, the one on the frontlines, the one that is fighting, the one which fought in the July War , is Hezbollah. Okay, we need to bring someone that can defeat and destroy Hezbollah, and destroy the Resistance front. Okay, such talk began to feature in the media in recent months. There is no need for us to analyse anymore, just as we were analysing the July War after it occurred. Now the Israelis have revealed everything, and the Americans are beginning to reveal everything. All the goals of the July War. Now [the Americans] are doing the same thing [regarding this issue]. This is not simple talk, this is an American candidate, and he is speaking on behalf of the American Republican Party, which has its own information [apparatus] and documentation. Anyhow, they don't even need to put forward evidence, they have admitted it [already] themselves, their [words] are present online on [various] websites. So they are the ones who created ISIS. More broadly speaking, they are the ones who brought about these Takfiri groups, whose overarching names now are ISIS and the Nusra [Front]. They brought them from around the world, after the failure of "New Middle East" [project]. Here listen to me carefully: after the failure of the "New Middle East" [project], and after the steadfastness of the resistance in Lebanon, and after the steadfastness of the resistance in Palestine, and the steadfastness of Syria, and the steadfastness of Iran, and after the defeat of America in Iraq, and its withdrawal in 2011, and after the beginning of the rise of the popular Arabs revolutions that ousted regimes that are part of the system [led by] America and allied to Israel, [after all of this] the Americans found themselves in a new situation. There is huge resistance axis. Imagine that things continued moving like the beginning. Israel in 2011, at the Herzliya Conference, said: "We are in the worst strategic environment since the establishment of the entity [of Israel]". Because they evaluated what happened in previous years. So now how can they face this huge, great, historic, [pan Arab-Islamic] development in the region? Can Israel start a war? But we have just mentioned that one of the outcomes was that Israel failed. It is no longer an effective tool for such a great confrontation anymore. With Hezbollah and the resistance in Gaza it failed, is it going to launch a battle on a regional-scale? No! Shall they send the American army? Well this army was in Iraq and is now in Afghanistan. It will not be able to change the equation. In that case what? A proxy war! And this what the United States of America is a master in, and it is what it did previously in Afghanistan. They came back to their old friends. Come O' Saudi Arabia and other [states], and gather them for us from all around the world, and let us go fight through them. Let us go fight [through them] the regime in Syria and destroy the Syrian army. Let us fight [through them] in Iraq, who refused to submit to our conditions, and let us shake up the situation in Iraq and destroy what was built and what left our control and obedience. And we shall send them to go destroy and Hezbollah in Lebanon, and control Lebanon and make all the Lebanese kneel to America and Israel, and [kneel] to America's collaborators in Lebanon, let them all kneel to them. And regarding Palestine, we will put an end to Palestine. And with regards to the whole Arab situation, rather than people caring about carrying out reforms in this country or that, they will begin to care about safety and peace, and how to get rid of ISIS and al-Qaeda and the Nusra [Front] and the Takfiris, and the explosions [that target] restaurants, mosques, churches, schools, shops, so that they consent to any ruler, regime, and power, and [that will cause them] to forget anything to do with freedoms, reforms, democracy, life, dignity, and all these slogans that were raised by Arab nations in the region, let alone [the cause] of Palestine. They brought this horde [of terrorists] to produce this destructive chaos in our region, and the Americans came and used them. O' our brothers, O' our sisters, O' our people, the Americans brought them, gathered them, funded them, armed them - ofcourse not with their funds, rather from Arab reserves - and the Americans opened up the borders for them and facilitated the way for them, and trained them, and fought through them. However, now, they have begun to reach a point whereby in some areas, this card has lost its value, just like what happened after Afghanistan. This card has lost its value. Today, Daesh is in Mosul and in Raqqa. Daesh today is an electoral vote in the US presidential elections. Barack Obama insists on the battle of Mosul and Raqqa. I don't whether he will get through with that battle in time or not. However, what's the purpose [of these battles]? Is it to save Iraqis and Syrians from Daesh? No! It is rather for the US presidential elections. He wants the Democratic Party to govern. Okay, even the Nusra [Front]. Until prior to the battle of Aleppo, a Russian-US agreement was being put together. This is in the media and newspapers. I am not revealing a secret. There was [efforts] towards a Russian-US agreement to crush Daesh and the Nusra Front. Why? Now someone may say there is a contradiction here. Not at all! They brought them along, exploited them, fought through them, and exhausted them, and now it is time to pick and harvest [the gains]. I talked about that before but I want to remind you of this. Five years ago, I told the fighters of al-Qaeda and the Islamic State in Iraq [It was not called Daesh yet]: O' you who consider yourselves fighters and mujahideen, and claim that you want to establish an Islamic government and an Islamic state! O' you [who consider yourselves as such], the US and Saudi Arabia and states in the region brought you along, armed you, facilitated your movement, fought through you, and supported you to achieve their goals and afterwards, they will extinguish you. This was five years ago. This does not need anyone who foretells the future, it does not require a fortune teller. This is derived from experiences, facts, and the nature of the foe and friend. Today I want to tell them - you will feel surprised that on the tenth anniversary [of the 2006 War], I will address Daesh and the Nusra Front and all these groups which are still fighting in Syria and Iraq, and Yemen, Libya, and Sinai. I tell them, and that's if they still hear any voices, if they still have a small place in their minds for my words, and if they still have any potential for some contemplation: O' you people! You were exploited for five years in order to destroy the Resistance Axis, and to destroy the nations of the region, and to destroy the hopes of this region, so that weak regimes will be built on its ruins, submissive regimes that submit and collaborate with the Americans and the Israelis. If you really still have anything to do with Islam, or any love whatsoever for the Prophet [Muhammad], and any relation whatsoever to the Quran, then stop this fighting that [serves] the interests of America in the region. Stop this fighting. Drop your weapons. Now [whether] we talk settlements and reconciliations - this might be an exaggeration. I call on all those who are still holding their arms - and we feel sorry for them -all those who call themselves self-sacrificing martyrs and are in fact committing suicide. You are committing suicide and killing your own brethren, for what? For who? For what goal? For whose sake? You are blowing yourself up in Aleppo, in Mosul, in Deir Zour, in Deraa, and everywhere in Syria and Iraq, in Baghdad and in Damascus, and in Yemeni cities, to serve whom? Whose project are you serving? For whose sake? In whose interests? O' people sit and contemplate for a second. Think for a while, and you will discover that you are being exploited, and that it's time for some of you - namely Daesh - to be eliminated, and the elimination of the others will be due when they will not be in need of them anymore. This is what I call for today before all the battles taking place now in the region. The scholars, the wise, the rational [people], the sages, and all the people who care for this nation and can say a word, make a call, or exert an effort, they must muster every effort possible to bury alive this ordeal that is ongoing in the nation and region. If these [groups] do not stop the fight on behalf of the Americans and their Israeli friends, then after all we will not have any other option. Day after day, the correctness of the decision to head to Syria and other places to fight is becoming clearer, because this is one battle, which Daesh is waging, here, here, and here. Daesh which is fighting in all these countries, was created and funded by America, and it facilitated its activities. Even now, when the US wants to strike [Daesh], it does so but in a limited manner, because it is not absolutely finished yet with employing it [for its interests]. We do not have any option other than remaining in the battlefields, in Aleppo and in other places and in any place where it is obligatory for us to be, we will be. We were, and we will always be where we must be, regardless of all the current intimidation. Still, the primary call today remains the call for awareness, reconsideration, contemplation, and reaching the truth of the tracks underway now in our region for the sake of Palestine, the Palestinian cause, the captives of Palestine who are struggling with empty stomachs, such as Bilal Kayed and his dear brethren, for the sake of those whom conspiracies [are underway against them, for the sake of the displaced and besieged, for the sake of Lebanon, Syria, Palestine, Yemen, Bahrain, Egypt, Libya, and all the peoples, societies, and states of the region. We are making a call for awareness, reconsideration, and reason. What they are calling us to is unreasonable. They are calling on us to withdraw from this battle. Some people in Lebanon tell us that it is required that you withdraw from Lebanon. They call on us to withdraw from the battle. For what reason are we to do so? Is it for Daesh and Nusra to gain victory?! If we quit, the Syrian Army quits, the Iraqi Army quits, the [Iraqi] Popular Gathering quits, the Yemeni Army quits, and the [Yemeni] revolutionary committees quit, Daesh will gain victory here and there and everywhere. What would be the fate of our peoples, governments, and region then? I have a couple of words on Lebanese affairs. It is clear that in Lebanon everyone is waiting for what will take place in the region, though things are in our hands. The Lebanese are able to settle their own affairs and address their causes. Everyone agrees that the key for everything is electing a president. Well, that's great. The information is in the hands of the people. They can sit and discuss and argue. As for us, even when lately a full package was discussed, several questions were posed. We said that we are committed to nominating General Aoun for the presidency. In fact, on the tenth anniversary of the July War, I want to clarify that our commitment was made before the July War. That means that when we were on the dialogue table before the July War, there were discussions. At that time, some political forces were conspiring against President Emil Lahhoud and wanted to oust him. Indeed, we did not accept that, and our choice was proven to be quite correct due to the performance of President Lahhoud in the government during the July War. His performance was sublime and great. At that time, a suggestion was made, and by that time we were already committed to General Aoun to the effect that in case of presidential elections, we will vote for him as a president for the republic. The July War did not take place by that time yet. The July War came to affirm also that this commitment was correct due to General Aoun's stance. We are all acquainted to that. Later on, they came and said we accept the candidacy of MP Suleiman Franjieh - our ally and friend. We talked in his favor greatly, and in the July War his stance was also crystal clear. However, we said that we have our commitment, and our old commitment is renewed. Now the chance is available. What I want to say today includes a little more positivity. If the sides concerned in this event want it to work out and they have any questions, we say what we have always said that we are open and positive as per the next head of government following the election of the president. I will stop here. There is a chance to take the initiative. Whom are we waiting for? What are we waiting for? The second point: some may say it is quite early to tackle this point, but it is not early anyway. Days ago someone - I will not mention his initials - made a mistake, an intentional mistake. This mistake was intentional since 2005, and we did not accept this mistake even back in 2005 when someone wanted - from now - to decide the next Prime Minister and Speaker. He suggested our brother dear Hajj Mohammad Raad as the head of the parliament, though he then apologized but that was not a slip of the tongue. This idea or this scheme exists, and it is old too. Today, from Bint Jbeil, I tell the owner of this suggestion and his accomplices that today is August 13th, and that means we are a long way away from the next parliamentary elections. Let the entire country, all the political forces, and all the political currents know that no matter what the results of the next parliamentary elections in Lebanon are, Hizbullah's candidate to the presidency of the parliament is one and only one. He is his excellency brother Speaker Nabih Berri. He - and the Amal Movement - is our partner in the battle, in politics, in negotiations, in fighting, in the battlefield, in pain, in [the suffering of] wounds, and in sufferings. So let them play another game. As such and consequently, the possible tracks are clear as per the presidency of the republic and the parliament. As per the Prime Minister, I say that we will be positive and open, and we will not complicate things. I will stop here. There is no need to exaggerate and say that you are enlarging the package. When we previously talked about the package, we were talking to solve your problem and not to solve our problem. Indeed, the country is concerned to move along in dialogue. Many recently tried to challenge the dialogue table, saying that there is no need for this dialogue and the table is absurd. No, the dialogue table is not absurd. The very meeting of the Lebanese in one place to talk and have discussions and exchange mutual blame is a source of political and security serenity for the country and for communication to search for solutions. Thus we assert the need to move along on the dialogue table. We also assert the need of the government to assume all of its responsibilities, even if it is in an exceptional, transitional stage. As per oil and petroleum, the country is suffering from a thousand files on the financial level, and a big part of the problems will start mushrooming in the days to come, and the real reason is financial deficiency and the budget deficit. Allah had bestowed on us a blessing next to us in the sea. Why don't we extract it? Why can't we let this wealth flow to the treasury to address the crises of this country? That's because a political decision was taken to cripple this file. Hopfully this decision is not a US-"Israeli" decision. Hopefully it is a local decision only. Still, the government is responsible for every moment, every hour, every day it wastes on Lebanon the chance of extracting its oil and gas and flowing revenues in the interest of the Lebanese people, and to solve the problems of the Lebanese people. Today, we have a chance, due to the results of the July War and due to the deterrence formula. All people know that there is petroleum here and there. Is that clear? There is gas here and there. Here a facility will be erected on the Lebanese territories, and there is a facility on Palestinian territories. I believe you understand what I mean. Lebanon today is in a situation in which it is able to protect its oil and to protect its petroleum. All what it has to do is to take a decision to extract its oil and petroleum to address its economic, living, and financial crises. As per the security issue and being concerned with the security issue and communication between the security apparatuses and cooperation between all sides, observing the security of the country in a region that is suffering from all of these difficult situations is the responsibility of everyone. Today, and as we approach the anniversary of the July war, we assert recalling His Eminence, Leader Imam Sayyed Mousa al-Sadr [May Allah restore him safe and sound]. We also recall his dear brethren and companions, and not only his friends who accompanied him to Libya, His Eminence Sheikh Mohammad Yacoub and Sayyed Abbass Badreddine. We reassert that this cause is the cause of a country, the cause of a people, the cause of a nation, and the cause of a resistance, because Imam al-Sadr was the Imam of the nation and the Imam of the Resistance. He was a very towering figure in this nation who had historic awareness, and for this reason they conspired against him, kidnapped him, and imprisoned him along with those who were with him. Today too, and as we approach this anniversary, we assert that we are all the children of this Imam, the students of this Imam, and the devotees of this Imam, and we will move along in the track of this Imam. Though I do not want to make a list of the names of the allies and the friends and the supporters because the list will be long and I would be embarrassed should I forget any name, however, allow me from Bint Jbeil in particular, to recall the honorable, supporting, fatherly stances of His Eminence Ayatollah Sayyed Mohammad Hussein Fadlallah [May Allah have mercy on him] along the whole track of the Resistance, as well as the stances of his father Sayyed Abdul-Raoof Fadlallah [May Allah have mercy on him] and the revered scholars from this noble family, including Sayyed Abdul-Mohsen Fadlallah [May Allah have mercy on him]. That is besides the revered scholars of Lebanon in general, and of Jabal Amel in particular. However, I wanted to name Sayyed Mohammad Hussein [May Allah have mercy on him] for his fatherly right and historic presence, especially during the July War, noticeably his fatherly stance which he expressed in that war when he referred to the resistance fighters as the fighters in the Battle of Badr, comparing them to the companions of the Prophet of Allah [Peace be upon him and his household] in addition to his stance from towards that battle and the era that followed it, as per its pains, sufferings, and the arguments and controversies concerning it. Dear noble brothers and sisters! Today, if we want to make a list of all the noble and honorable in this world who backed the Resistance and fought by its side, the list would be quite long. This also applies to the martyrs. I know that some families of martyrs expect me to mention some names. But I apologize from them, though I have the honor to mention the noble names of these martyrs. I really have the honor to mention the name of this martyr and that martyr; however, I will avoid falling in the forbidden by mentioning some names and forgetting others. God willing we will not forget them on other occasions that give the opportunity to mention their names. God willing Allah Almighty will assist us to mark all of these occasions with dignity and pride. Allow me to wrap up my speech with a word inspired by the July War and the first days of the July War in particular. I said this on one of the Ashura nights. However, usually the speeches of the Ashura nights are not broadcasted by media outlets other than Al-Manar. Allow me to reiterate the idea because it is related to the July War and to what we are living and what we are heading to. I was talking about my brethren and me. Since we were young, we used to attend the mourning ceremonies of Abi Abdillah al-Hussein [Peace be upon him] and hear a phrase that is oft-repeated by the preachers. So over days and years, we used to hear this phrase, and it was carved in our minds and hearts and souls. We used to understand it and comprehend it in various degrees. It is a well-known phrase for Imam Hussein [Peace be upon him] which he said on the tenth of Muharram, and I always reiterate on the tenth of Muharram: "Beware! Now this illegitimate son of the illegitimate father has stationed me between unsheathing the sword or humiliation, and far be it that we accept humiliation. Verily, Allah, His Prophet, and the sacred laps which nursed us, the modest, and those who abhor disgrace, disagree to it that we bow down to the ignoble men, and they exhort us to being killed manly in the battlefield over it." This we have memorized since we were young. What I said is that ten years ago it was the first time that I feel that I understood - to an extent - the essence and meaning of these words. You too understood it along with me at that moment. Why? That's because during the first days of the July War - brothers and sisters - some mediators suggested to us the following: "Israel" along with America and the entire world took a decision to crush you. The only solution to stop the war is to hand in your arms - all the arms of the Resistance and not [merely] the missiles. The second condition is to disband the Resistance. Third was to agree to have multi-national forces as I said before, and not the UNIFIL, but multinational forces like those who were occupying Iraq. These forces must be deployed on the Lebanese-Palestinian borders, the Lebanese-Syrian borders, the airport, and the seaport. They want to occupy the country. Fourth was handing in the two "Israeli" soldiers unconditionally. They conveyed the conditions to us. That was at a time when hundreds of raids were being carried out on us. Thousands of raids were staged during the first days. Almost the entire world was conspiring against us. We did not have but Allah Almighty. They put us before two solutions: Either you move along in the war - you go to the war and they crush you, kill you, slaughter you, take your women as prisoners, displace you, and demolish your houses - or you accept these humiliating conditions that at that time meant putting an end to the Resistance, the return of the occupation, the prisoners remaining in prisons and the imprisonment of new detainees, and handing Lebanon to the US and its allies. This is not only humiliation but also the loss of everything - the loss of this world and the Hereafter. At that moment, my brethren and I were holding discussions, and it was as if Abu Abdillah al-Hussein ibn Ali ibn Abi Taleb [Peace be upon them] was before our eyes there on the tenth of Moharram saying: "Beware! Now this illegitimate son of the illegitimate father has stationed me between unsheathing the sword or bear humiliation, and far be it that we accept humiliation." We told them: verily, Allah disagrees to it that we bow, that we give in, that we hand in our country and prisoners, and that we disgrace our people. Allah, His Prophet, and the sacred laps which nursed us, the modest, and those who abhor disgrace, disagree to it that we bow down to the ignoble men, and they exhort us to being killed manly in the battlefield over it. Some of those honorable were martyred; however, Allah wished that we gain victory; thus was the victory of the July War. This is the case in all fields. I tell all those who plan, conspire, contrive, bet, and try to harm the morale of our masses and those who back us, our morale, our will, our determination, our trust in Allah, our trust in our people, and our trust in our capacities: This is the spirit that dwells in the bodies of the men, the young, and the elderly. You can't do harm to this spirit, neither through soft wars, misleading, jeopardizing, instigation, hard war, killing, assassinations, threats, or intimidations. In this nation, on this land, in this region, since this Resistance was launched, senior martyrs fell as Sayyed Abbas, Sheikh Ragheb, Hajj Imad, and many others; but we were determined, we took the decision, and we will move along on our path with this very tough, faithful, determined spirit. We will move along on our path in Lebanon, in Syria, and in the entire region. At the end of this blessed ceremony, I tell you what I told you in July: We entered the era of victories. This is the title of this ceremony: We entered the era of victories, and the time of defeats has come to an end. The scheme is collapsing now in Iraq, in Syria, and in the region. The new version of the US scheme is a very grave project and a very dangerous conspiracy which exploited - as I said before - tens of billions of dollars, thousands of tons of ammunition, hundreds of thousands of fighters, and sectarian instigation. The toughest thing the US and its tools can do in the region - and they did not do in July War - they are doing now. They did everything they can do: sectarian sedition, factional sedition, money, suicide attackers, and gathering the savage beasts from around the world. Here their project is collapsing. This scheme has no prospects for the future. The future of Lebanon is the Resistance, the future of Palestine is the Resistance, and the future of Syria is the Resistance. The future of the region is the future of our peoples and our nation and its dignity, pride, and sovereignty. Peace be upon you and Allah's mercy and blessings.